The Oregon Coast is well known for its beauty. The rugged coastline with its constant wave and surf action provides the calming sounds of the ocean that all can hear, but a diver also sees the giant kelp forests and gets excited about the promise of abundant marine life, brilliantly colored anemone, sponges, cute little reef fish and huge ling cod, large plate-sized rock scallops, abalone, giant Pacific octopus, and friendly wolf eel. This is truly a diver's paradise. There are no stories of skin divers prior to World War II, but with the development of rubber dry suits and neoprene wetsuits in the early 1950s, divers began to explore the reefs out past the surf and in protected coves near the shoreline. 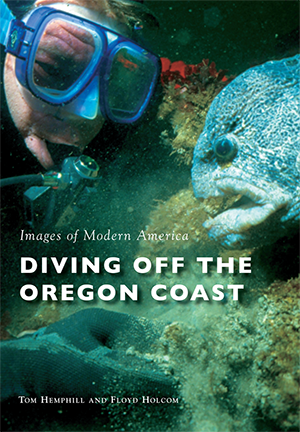 Images of Modern America: Diving off the Oregon Coast showcases the images of a few diving pioneers, early and current dive stores, the beautiful coastline, and the colorful world underwater. Floyd Holcom and Tom Hemphill have enjoyed diving many sites along the Oregon Coast, from the countless offshore islands and reefs of the southern coastline to the northern coast at the Tillamook Head lighthouse.